When ever I want to practice all this Before I need it swmbo just glares at me for playing . Trick is the getting started as the Disco's trickery can sometimes play against you if your not aware of what it's doing. If I'm getting nowhere I have had success by putting the rubber floor matts under the wheels the car quickly senses the slightest traction on a wheel and directs drive so you just need the matt wedged under the edge of the tyre. Once you start to move DO NOT try and accelerate until you have decent momentum otherwise it may dip the power. Agreed when competing in Morocco in Discovery 3's and driving the sand dunes in Macontierra (not sure if thats spelt correctly) we very soon realised that the DSC does not switch completely off. If the car detects severe body roll it will back the power off. You very quickly learn where the DSC parameters are and drive under them. Not sure why pressing the DSC or Dynamic Stability Control switch will help when the vehicle is sat spinning motionless in a grassy field? Getting the TC to react is the key, if all 4 wheels are turning at the same speed the TC has no idea that the car is motionless, by applying power hopefully you will make a wheel spin faster than the others, the TC will then kick in and hopefully you will start making progress. Standard or off road tyres may or may not make a difference no more than two different standard tread patterns will. If you are lucky at that moment in time if the type of mud suits your tyres you wont have a problem. The only reason I use off road tyres is they have a stronger side wall. I have seen cars with standard worn tyres get further than a car with aggressive off road tyres. Its all about understanding whats going on and technique. In the Beginning there was nothing, which exploded. As others have said, if there is no traction, you ain’t moving. However, your route may or may not help. We all generally like to take the most direct route for stuff, if you walk the field to see which areas are soft and which ones aren’t, you may be able to link up a route to avoid the worst areas. I’ve had to recover my old bosses D3 and trailer from a field a few times because they hadn’t got the lines right and bogged. Firmer ground and Duratracs on mine helped get them free again. In general, I turn DSC “off” for off road stuff I feel I would need the benefit of not having it slap the wrist. I’ve also been sat there, all 4 wheels slowly turning, going nowhere and the cars electronics still trying to make it move. As well as never quite being off ..we must remember that DSC is really designed to deal with lateral forces ...and you have to reach the threshold of those lateral forces for it to intervene.....if you are sat stationary in a field with 4 wheels spinning then it shouldn't reach anywhere near that threshold ...whereas if you had managed to get moving swiftly but say sideways ...then it might. It's always worth a try, especially if you find yourself robbed of power or find power and momentum is lost with yaw. Of course if you are properly stuck and need to get out on your own steam you could tie a piece of timber to a wheel, but make sure the ropes don’t catch on the brakes. Range selection is another topic, especially if gradient or towing is involved. First attempt with normal operation was most disappointing. Just a lot of noise and grinding from the TC doing its best to melt the brakes. Then I selected Sand mode and disabled the DSC. I got going then applied full lock and a boot of acceleration, the results were very satisfying. Managed to get it doing a number of 360 turns with the car staying roughly on one spot. The TC was still applying some brake, but it was letting it go a little bit. Brakes were smokin afterwards though! NB Private car park, and if my Blackvue wasn’t knackered I’d show you a vid! I carry some remnants of the big plastic bread delivery trays I found at side of the road. ( honest ) ... weigh all and take up very little space but are ideal for this scenario. Also used them in the past to stop VX Carlton sinking through the grass at a friend's caravan. 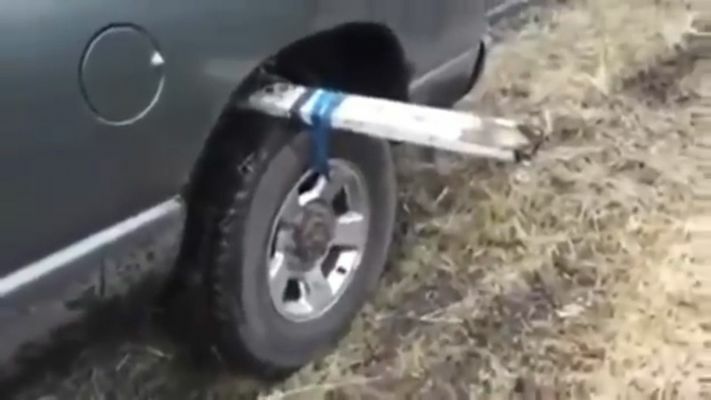 Another trick is to throw a tow rope under a wheel. Dean.